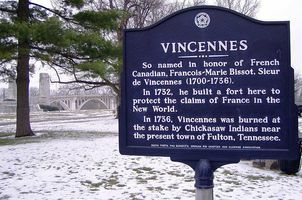 BISSOT DE VINSENNE (Vincennes), JEAN-BAPTISTE, second ensign in the colonial regular troops, agent of New France among the Miami Indians; b. 19 Jan. 1668 in Quebec; d. 1719 among the Miamis near the present site of Fort Wayne, Indiana. Bissot de Vinsenne was one of 12 children of François Byssot* de La Rivière and Marie Couillard. Claire-Françoise, a daughter of this marriage, married Louis Jolliet*, the discoverer of the Mississippi. Jean-Baptiste entered the seminary of Quebec in 1676 but, being unfit for the ecclesiastical state, left this institution in 1680. On 20 Oct. 1687, as he was preparing to leave for France to seek employment, he asked the Conseil Souverain to grant him his letters of majority so that he might have the right to administer his property. We next hear of Vinsenne in 1694. At that time he had returned to Canada and had apparently decided to make his career in the west. In 1694 and 1695 he sold the properties which he owned in the colony, consisting of half the seigneury of Vincennes, lands in the seigneury of Lauson, and certain rights in the seigneury of Mingan on the north shore of the St Lawrence. Towards 1695 he was named second ensign in the colonial regular troops and the following year was sent by Frontenac [Buade*] to command among the Miami Indians, who inhabited the territory southeast of Lake Michigan. 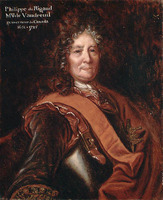 In 1704, the governor, Philippe de Rigaud de Vaudreuil, informed the court that Vinsenne enjoyed much influence over this important tribe and that New France stood in great need of his services. Vinsenne was not above trading with the Indians when he went on his diplomatic missions to the interior. He did so in 1704 when Vaudreuil sent him among the Miamis for the purpose of urging them to offer compensation to the Senecas whom they had recently attacked. This misuse of his commission greatly angered Pontchartrain, the minister of Marine, and may explain why Vinsenne never won promotion in the colonial troops. Vaudreuil, however, did not lose confidence in his agent. He continued to regard him as the colony’s leading expert on Miami affairs and to make frequent use of his services. From 1712 until 1719 Vinsenne appears to have resided permanently with the Miamis, arbitrating their quarrels with the Illinois and urging them to make war on the Foxes. After 1715, one of his principal responsibilities was to prevent his Indians from falling under English control. To achieve this end he was instructed by Vaudreuil to exhort them to move away from the Maumee River, where they had recently settled, and to return to their old village near Fort Saint-Joseph at the southeastern tip of Lake Michigan. Only a few of the Miamis had complied when Vinsenne died in 1719. 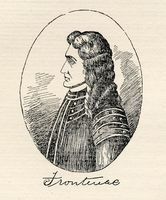 For this reason, the governor decided to consolidate French control of the Maumee River area by sending the experienced Jacques-Charles Renaud Dubuisson to establish a garrisoned post there in 1721. On 19 Sept. 1696, in Montreal, Vinsenne had married Marguerite Forestier, daughter of Antoine Forestier, surgeon, and of Marie-Madeleine Le Cavelier. They had four daughters and three sons, one of whom was François-Marie. AJM, Greffe d’Antoine Adhémar, 6 sept. 1696. AJQ, Greffe de Louis Chambalon, 25 oct. 1694, 22 févr., 9 mars 1695, 21 mai 1703. AN, Col., B, 27, 39; C11A, 22, 24, 33, 34, 35, 40, 42, 124; D2C, 47. “Correspondance de Vaudreuil,” APQ Rapport, 1938–39, 1947–48. Jug. et délib., II, 799, 834–35; III, 189–90. P.-G. Roy, Inv. concessions, III, 19; Sieur de Vincennes identified (Ind. Hist. Soc. pub., VII, no.1, Indianapolis, ). Yves F. Zoltvany, “BISSOT DE VINSENNE, JEAN-BAPTISTE,” in Dictionary of Canadian Biography, vol. 2, University of Toronto/Université Laval, 2003–, accessed April 26, 2019, http://www.biographi.ca/en/bio/bissot_de_vinsenne_jean_baptiste_2E.html.